This past week was spent with a small group of 12 year old students out in Kananaskis. They – we – were learning more about teamwork, leadership, and meeting challenges together. Fun stuff, and one big challenge was the super subzero temperatures. The daytime highs were minus 20C, and in the valleys and shadows a touch colder than that. At sun up yesterday, it was minus 35! Yikes – toe freezing temperatures! It was certainly a talking point amongst the students – and they were sold on the notion that few people can say they’ve experienced what they did in such temperatures! I was so happy to see them rise to the challenge of skill building and cooperating when it could have been easy to complain. Yes they mentioned the temperatures (hard to ignore! ), but most of the time they cheerfully stepped up and reached personal goals set each day. City kids with very little outdoor winter experience between them, they were delighted to be in a wonderful setting and were heard exclaiming how pretty the landscape was. Does this tree look like it needs a hug? 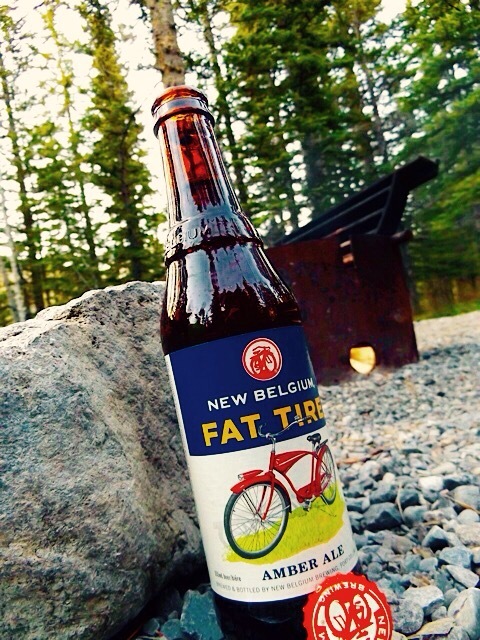 Let’s finish it later, when it warms up…late April sound good? It was too cold to bore into trees (they were frozen) and extract a core sample, but it wasn’t too cold to hike to Chilver Lake (one student renamed it Shiver Lake) and admire a long view in the late afternoon. No sign of the cougar seen by many the previous week, but deer tracks, coyote tracks, and squirrel tracks were everywhere – those little guys are so industrious and could still be spotted scampering from tree to tree and scurrying up trunks. It was too cold to stand around watching for long, but they always excited our students. Seeing students learning and problem solving together far from their regular classroom, and in trying conditions, gives me hope for the future. Not just their appreciation for the environment, although that is essential. No, it’s something else as our generation looks to the next. Let’s face it, when I’m in the retirement home (many, many decades hence), the young ones we’re teaching today will be (amongst other things) the healthcare policy makers, care workers, nurses and doctors looking after me in my dotage. Anyway, on the basis of what I observed this past week, there are going to be some fine citizens taking responsibility for themselves and each other in the future. Too cold wasn’t possible for these young people – and, one day, we might all be safe in their hands. A happy thought. Posted on December 9, 2016 December 8, 2016 Categories adventure, Alberta, Canada, education, hiking, Kananaskis, mountains, nature, outdoors, photography, wildernessTags Canada, education, hiking, Kananaskis, mountains, nature, outdoors, photography24 Comments on How cold is too cold? Sometimes, undiscovered and new outdoor places can almost be in your own backyard! This was the case just last weekend for us. 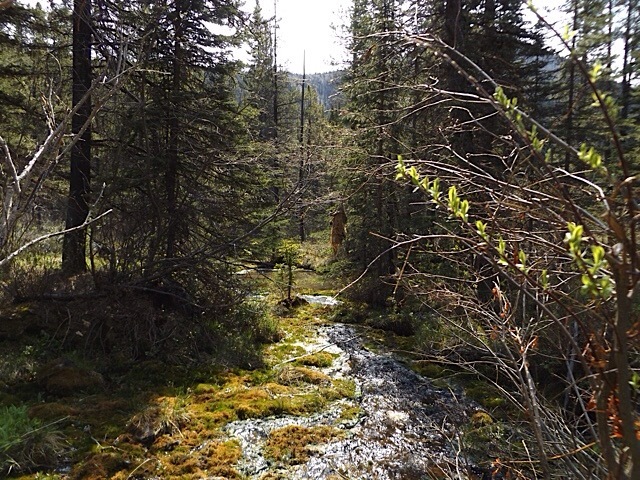 We stayed at a new – to me – campground, and it was a wonderful discovery. Our short stay at the Tunnel Mountain campground just outside Banff a couple of weeks ago was enjoyable enough for the views and to try the new tent, but it maybe wasn’t the most peaceful of places. 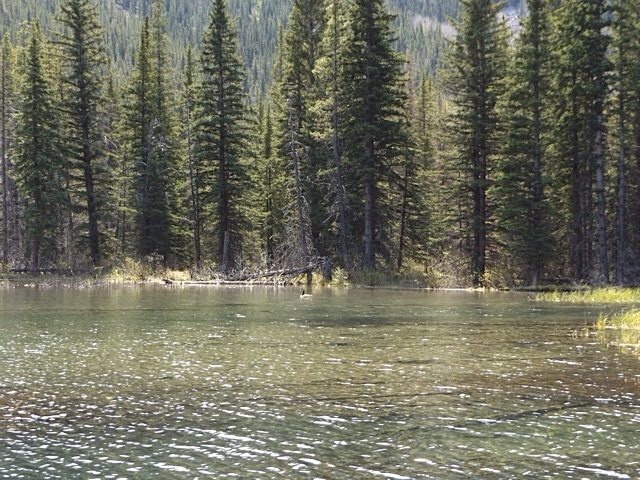 When I mentioned this to a colleague, she recommended Beaver Flat campground on the Elbow River in Kananaskis country. I’ll admit to being a bit doubtful, thinking that a site barely an hour from the city couldn’t possibly be tranquil. 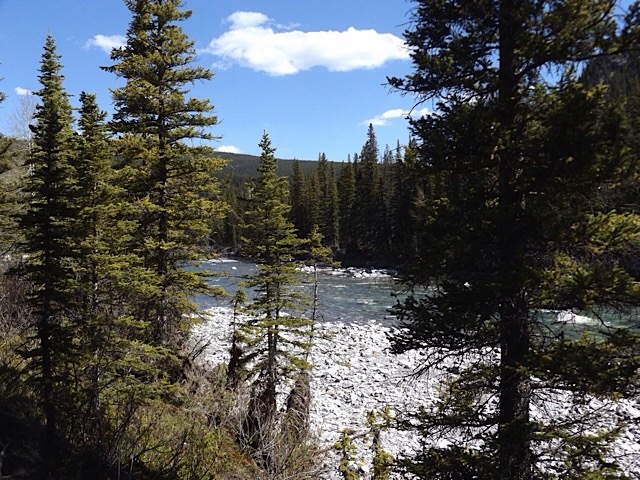 The Elbow River – a little bit tranquil? 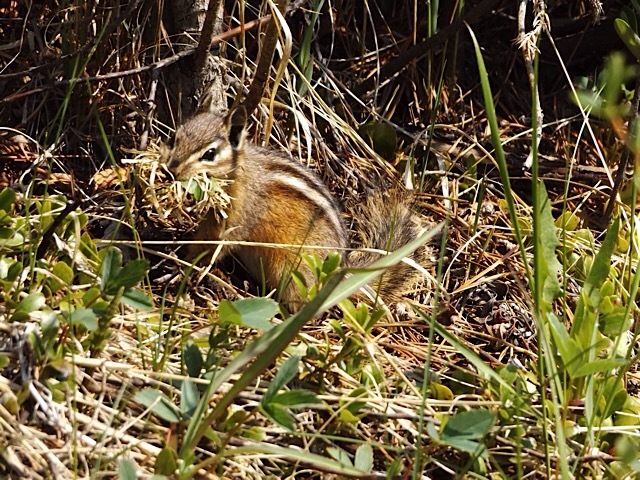 Our weekend patch of the Elbow valley was people quiet but teeming with wildlife – although we didn’t see anything much larger than this little guy: He was busy enough, so we backed away! Several times, a pair of geese flew directly over our tent, heading for the pond pictured below – we saw this single goose bank in and land on the water, an impressive sight! The goose in this photo seemed quite despondent, calling frequently. We wondered, had it lost a mate, was it one of the pair we kept seeing? 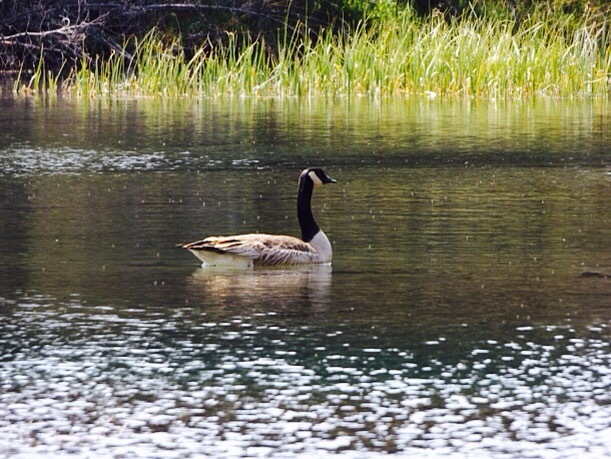 A lonesome goose? 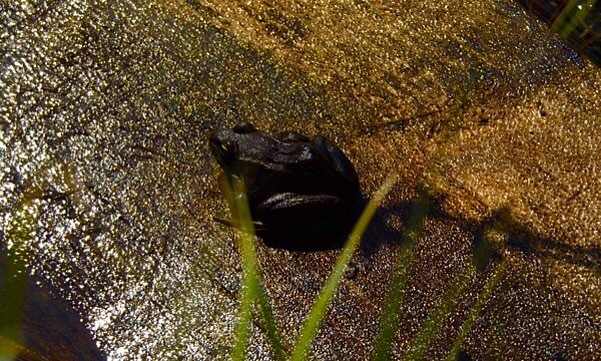 Didn’t see any beavers, but we did spy a small amphibian: It was tiny! Quite honestly, walking around and investigating the immediate surroundings, we didn’t get more than an hour from the tent yet really enjoyed our explorations. It was a welcome short break from the city, and a chance to recharge before the final few weeks of a busy school year. Come the evening, is there a better way to unwind?! I’m so happy to have had the recommendation about where to camp out in Kananaskis, as it was such a pleasant place to spend a weekend. 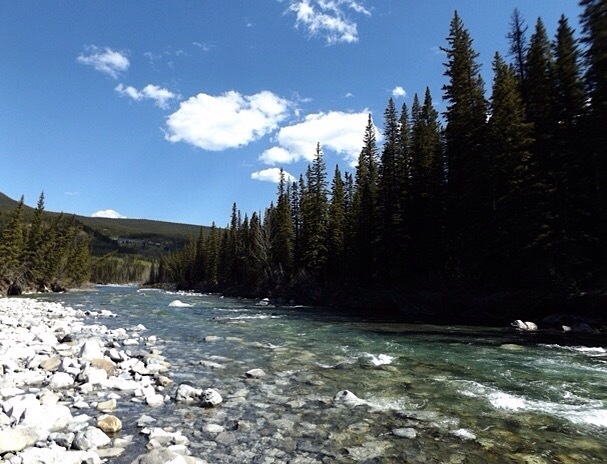 It’s early in the camping season here, and K-country does get busier as the weather warms up, so I’m passing on the recommendation: if you get the chance, head out to the Elbow valley and stay in one of the campgrounds sooner rather than later – you won’t regret it! You don’t have the enormously epic mountain scenery of the nearby national parks, instead it is gentler, yet still rugged, scenery. Old and plaid, and enjoying K-country! 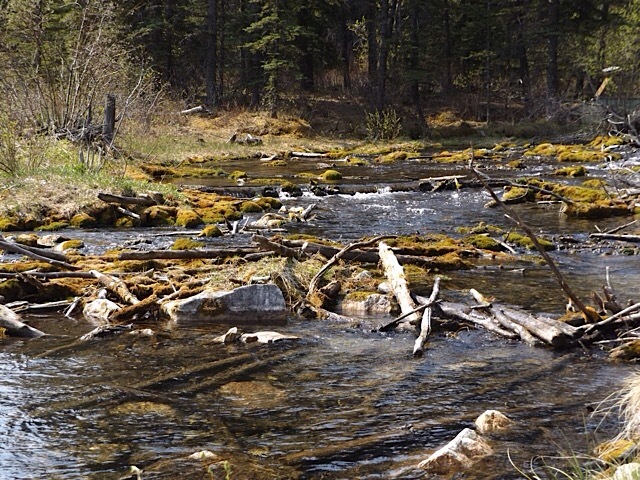 Do you have a favourite camping spot, or a campground recommendation? Thanks for reading, please feel free to share or make a comment, and keep your guy ropes secure. 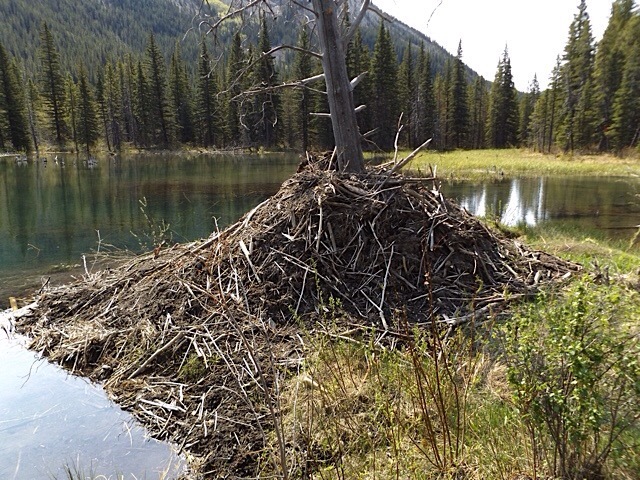 Posted on March 13, 2015 March 13, 2015 Categories adventure, Canada, humour, Kananaskis, not too serious, outdoors, photography, travel, Uncategorized, wildernessTags adventure, Canada, hiking, humour, Kananaskis, mountains, outdoors, photography, wilderness, winterLeave a comment on Last chance for a winter walk – where did winter go?